It has been an amazing summer weekend. No made-for-us plans, beautiful weather, and lots of activities around town. I was looking for something to do outdoors Friday evening with our niece and settled on a local county fair with 4-H judging, carnival, and the whole lot. It was ok, not a grand county fair, but a nice evening out before checking out Guardians of the Galaxy. If you haven’t already, definitely go see it. Very entertaining. When looking for out county sponsored activities I found a Vietnamese Cultural Heritage Festival happening Saturday and wanted to check it out. We took Anh’s sister and fiancé (yep – did I tell you they got engaged?!) out to dinner and then went over to the park to see what the festival was all about. We were all hoping for some cha gio or goi cuon, but no food in sight. 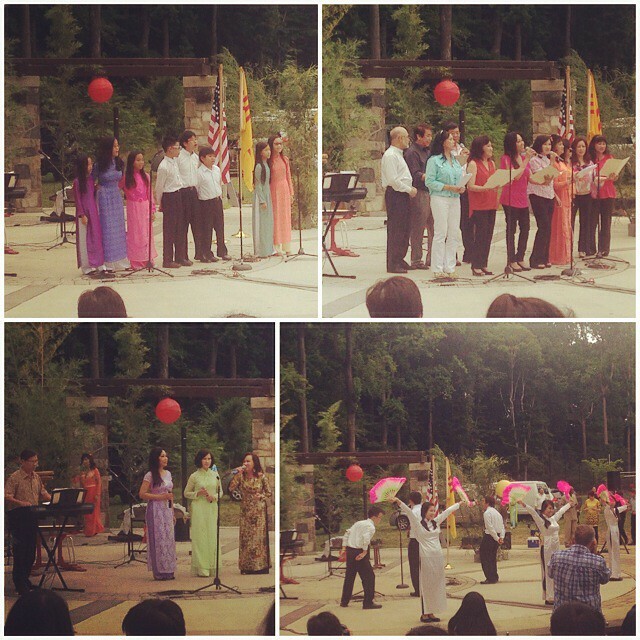 The concert was a review of local and internationally known Vietnamese singing groups – some adorable kids (tweens to teens), George Mason University Vietnamese society students, some adult troops. The highlight of the evening was the Nguyễn Đình Nghiã ensamble, whose father was a a renowned musician in Vietnamese communities – and internationally. They played traditional instruments and melodies that were gorgeous. Towards the end, two performances were lip syncing popular soap opera acts that were apparently three mothers in law complaining about the women their sons married, and the rebuttal from the fathers who didn’t seem to care. Pretty entertaining, even though I could only pick out a few words here and there. The evening was entertaining, to be sure. The whole event is part of a cultural heritage series the county produces, which is great, but I was really hoping for some food and better organization. There is another Viet Fest in a couple of weeks that we’re planning to visit. It did inspire me to go watch one of the Vietnamese variety show reviews they still have at the casinos. Who are some of your favorite Vietnamese artists or shows? Did I mention that on this day last year we had our dam hoi engagement ceremony? Time sure does fly. Before we know it, we’ll be married for one year already and then off to Vietnam!